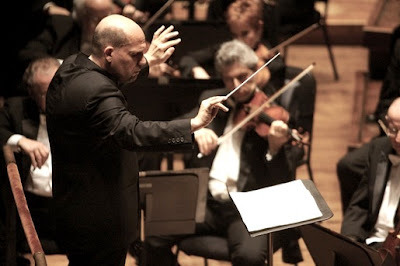 As he nears the end of his second season as music director of the Dallas Symphony, Jaap van Zweden has clearly raised the quality of playing in the orchestra. There have not been many personnel changes, but there has been a palpable exploitation of the enormous pool of talent already in the orchestra. A case in point: the trombone section has always been ‘good’ but now it is ‘remarkably good.’ The sureness of intonation, the beauty of tone, the balance between the three instruments and tuba – all these things are on a level of refinement only hinted at in the past. One has to think that it is van Zweden who has inspired these players to do better. As a conductor, you should ask the orchestra: how do you connect an up-bow to a down-bow? Are you doing it differently in Brahms than in Beethoven? I would say yes. Completely. There is a different connection between one note to the next in Brahms than in Beethoven; you use a different technique. Phrasing with the right arm is a little bit different than with the left arm. For Brahms, you have to deliver differently with your right arm than with any other composer, because of the musical sentence structure. When you have a phrase, it’s usually long, and more connected. We need to know exactly where to use different styles of bowing. This kind of detailed thinking is obviously being translated into action in the Dallas Symphony rehearsals these days, and it is paying off handsomely. In Schönberg’s Verklärte Nacht and in the Brahms Symphony No. 2 at the Myerson Symphony Center recently, I heard music-making that was consistently energized and string playing that effortlessly ran the gamut from incredibly delicate to full-bodied in the style of the great European orchestras such as the Vienna Philharmonic, the Berlin Philharmonic, and, of course van Zweden’s alma mater, the Royal Concertgebouw. It is important to remember that Arnold Schönberg wrote his string sextet Verklärte Nacht in 1899, just two years after the death of Brahms. The music clearly shows the influence of Brahms and other composers of the period such as Wagner and Liszt, but Schönberg soon came to the conclusion that the music of the late-Romantic period, with its increasingly chromatic and dissonant harmony, was coming to a crisis. Mahler found lots of life left yet in the older forms and techniques, but Schönberg was a much more radical character. He created what became known as twelve-tone music and set off on a course that led to ever more difficult music and. in so doing, left general audiences behind. Verklärte Nacht gives no hint of the radical Schönberg to come. It is passionate love music in the tradition of Wagner’s Tristan und Isolde, albeit building on the string techniques developed by Brahms and Dvořák. In its original version for six solo string players, it is deeply personal music and very difficult to play, especially for the lead violinist. Schönberg himself did the arrangement for string orchestra and while this version gains immensely from the added weight of sound, it simultaneously becomes somewhat less intimate. The minute inflections which can be conveyed by a solo instrument are all but lost when the same part is played by eight musicians. It is also more difficult for eight musicians to play an exposed phrase in tune than it is for one musician. Performance difficulties notwithstanding, this is a glorious work and it was given a glorious performance by van Zweden and the strings of the Dallas Symphony. One of the challenges for a conductor in this piece is that the music can seem to be stopping and starting arbitrarily. Not so in this performance; van Zweden made the numerous tempo changes seem perfectly natural. One can imagine a more intense and wilder interpretation of the piece, and one more agonizing in its emotion, but the careful realization of dynamics – the opening bars were almost inaudible – and the attention given to finding clarity in the dense contrapuntal textures more than compensated in this interpretation. After Schönberg’s Verklärte Nacht, came Brahms’ Second Symphony. Van Zweden is not known to be a willful conductor who favors his own insights over the composer’s instructions. He was encouraged by Leonard Bernstein, but his interpretative preferences have more in common with conductors such as Bernard Haitink and Sir Georg Solti – mainstream, one might say - with very little pushing and pulling and no attempt to make Brahms’ brass section produce Straussian heroics. That said, this Brahms was engrossing and very satisfying. Van Zweden’s tempo for the first movement initially struck me as a little too fast, but then I got used to it and heard how it brought a lilting waltz quality to many passages. The second movement clipped along as well. I would have preferred more expansive phrasing and more mystery. The tempo of the last movement was somewhat restrained, resulting in a certain loss of excitement. On the plus side, one could hear every detail, especially in the tricky syncopated sections. Significantly, van Zweden chose to reseat the Dallas Symphony for this concert - a move that paid enormous dividends. The new seating was similar to that used by the Berlin Philharmonic, with the violas on the outside right of the podium facing the first violins on the left, with the cellos moved upstage behind them. The placement of the violas in this position for this concert was certainly compelling, making the two distinct viola parts in the Schönberg that much easier to hear. This seating arrangement also worked well for the Brahms, producing – at least in this performance - a wonderfully rich blend of sound in the strings. What was remarkable about the Brahms performance was undoubtedly the quality of the ensemble playing. Phrasing and articulation was matched in all sections - strings, winds and brass alike - and the tonal quality was carefully matched too. At this level, one takes it for granted that all the musicians can play all the notes but that is not the appropriate criterion. What one hopes for and often achieves in the best chamber music performances and less frequently in symphonic performances, is a complex unity of execution. This performance of the Brahms Second Symphony had that unity of purpose and accomplishment. Has New York heard this extraordinary combo in concert? I would venture to suggest that it’s time for van Zweden and the DSO to take their collaboration on the road, with an annual visit to New York in the five-year plan. No sooner had this “Casual Friday” concert ended, than word came that Emanuel Borok, the DSO’s concertmaster for the past 25 years, has decided to retire. Borok is a wonderful musician and leader and a great help to van Zweden; he will be missed. Borok was born in Latvia and spent eleven years in the Boston Symphony before coming to Dallas. He has often been featured in concertos with the orchestra. This was a “Casual Friday” concert. The concerts begin a ½ hour earlier, there is no intermission, patrons are encouraged to wear jeans, and there is a jazz band playing in the lobby after the concert. Onstage, the members of the DSO appear in casual black outfits instead of in tails. Presumably, the idea is to attract a different type of audience - people who consider symphony concerts too formal and too long, people who may never before have attended a classical concert. An informal dress code, and an opportunity to mix and mingle after the concert are a good start, but in my opinion, the "Casual Friday" concept could go even further. Some insights on the program from the stage would enhance the experience. If the conductor is not comfortable in this role, someone else could be found to warm up the audience and introduce the music, possibly through the use of multi-media. Personally, I suspect that ticket prices are a major reason for people staying away from symphony concerts, in which case, ticket prices for “Casual Friday” concerts ought perhaps to be cheaper, given the shorter programs. As the Arts District continues to blossom in Dallas, adding new buildings every few years, it has become one of the city’s premiere destinations. With that distinction, the surrounding neighborhood is taking flight too. A new restaurant called Samar, the creation of chef Stephen Pyles, opened last October at the corner of Ross and Olive, just a few short blocks from the Myerson. It’s a small venue, seating only about 70, but it is one of the most inviting and imaginative in the city, with a menu devoted to various kinds of tapas-like dishes from Spain, the Mediterranean and India. A couple can make a meal out of three or four of these reasonably-priced, delicious dishes. My wife and I shared Lahmaçun (Turkish Spiced Lamb “Pizza”), Ajill Tagine Maa Couscous (Veal Tagine with Medjool Dates and Tri-Color Almond Couscous), Mumbai Ka Badi Jhinga (Tiger Prawns “Bombay Style” with Crispy Okra and Spiced Pear Chutney), and Carmelized Apple Empanada with Cinnamon Ice Cream. If you go, consider sitting at the counter where you can watch everything being prepared with love and expertise at top speed in the open kitchen.